The Visiting Artists & Scholars program at UofT Music provides our community with rich opportunities for interaction with the world's leading scholars, composers, and performers. The Louis Applebaum Distinguished Visitor in Composition was established by Sandra and Joseph Rotman to honour the memory of the Canadian film composer Louis Applebaum (1918-2000). The inaugural visitor was UofT alumnus and 2013 Oscar Winner Mychael Danna. Subsequent visitors included Paul Chirara, Richard Bellis, Lawrence Shragge, and Richard Bronskill. The 2017 visitor was Howard Shore. Established by Roger Moore, one of Toronto’s most ubiquitous supporters of new music projects, Moore Visitors have included Steve Reich, Krzystof Penderecki, Maria Schneider, Gabriel Prokofiev, Salvatore Sciarrino, and Nicole Lizée. The visitorship is often linked to UofT’s New Music Festival and this year features Japan's preeminent living composer - Toshio Hosokawa. 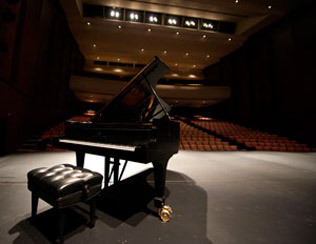 Established by the family of William and Clifford Smith on the occasion of their 50th wedding anniversary, the Smith Visitor provides annual funding for visits from international scholars and performers. Visitors have included percussionist Dame Evelyn Glennie, composer David Maslanka, conductor Victor Feldbrill, jazz pianist Vijay Iyer, and writer Paul Griffiths. This year composer and famed music educator Rob Kapilow will be working with the faculty to present his What Makes it Great® series over 3 concerts. Named for a great collector of vocal music and historical recorded sound whose collection and trust is stewarded today by an even greater connoisseur Stephen Clarke, the Stratton Visitor brings distinguished specialists in the field of voice and collaborative piano, recent among them Dawn Upshaw, Warren Jones, Stephanie Blythe, Catherine Wyn-Rogers, Barbara Hannigan, Stephen Wadsworth, and Judith Forst. Coming up this year is Jessye Norman, acclaimed, Grammy award winning dramatic soprano. Established in 2014 by arts philanthropists John and Claudine Bailey, this visitorship brings a jazz performer/arranger to the Faculty. Bailey Visitors have included Mike Holober, Dave Liebman, Norma Winstone, and Renee Rosnes. This year Grammy-nominated composer and trumpeter Tim Hagans will perform with both big bands. This program, still seeking sustaining sponsorship, celebrates UofT’s distinct world music ensembles offerings and its leading ethnomusicology graduate program. Inspired interactions with expert artists in Korean drumming, Native American voice, Brazlian cavaquihno, Balinese gamelan and dance, Inuit throat singing! Interested in sponsoring this: Please contact our director of advancement Bruce Blandford. Established through a bequest from Canadian ethnomusicologist, composer, and pianist Kenneth Peacock (1922-2000), the Lecturers are distinguished scholars in humanities-based research in music, such as Carl Schachter, Peter Williams, Kerala J. Snyder, Kay Kaufman Shelemay, Alexander Rehding, Scott Burnham, Suzanne Cusick, and George E Lewis. This year's Peacock Visitor is Ellie M. Hisama. Established to honour Herman Geiger-Torel (1913-1976), longtime General Director of the Canadian Opera Company and major influence on the development of the Opera Division. The annual lecture brings a distinguished figure in the opera world such as today’s COC General Director Alexander Neef and Music Director Johannes Debus, as well as John Adams, Sir Andrew Davis, Tim Albery, Sir Thomas Allen, and Joel Ivany. The year's lecture will be given by Stephen Clarke. Lorand Fenyves (1918-2004) was a world-leading violin pedagogue who taught for many years at UofT Music. The Residency was established by his colleagues, friends and students and honours his legacy by bringing distinguished artists and teachers to UofT Music biannually. Visitors have included Peter Frankl, Steven Isserlis, Miriam Fried, Menahem Pressler, and Atar Arad. In 2016 cellist Laurence Lesser joined the faculty in residency, performing a solo recital and public masterclasses. Supported annually by distinguished Canadian soprano and UofT alumna Riki Turofsky who noted: “When I was a student at Opera School, we did not have Master Classes with visiting artists. After graduation I participated in classes with exceptional artists like Lotte Lehmann, Pierre Bernac and Martial Singher. Those unique experiences are indelibly printed in my memory and were crucial to my development as a singer.” Michael Schade, John Fanning, Sondra Radvanovsky, Adrienne Pieczonka, Stephen Lord, Johannes Debus, and Ben Heppner are among those who have given masterclasses. This year Thomas Hampson, America's foremost baritone will conduct a Master Class with our voice studies students. UofT Music is the privileged host of many Resident & Visiting Ensembles. Hosting ensembles is another way we provide rich experiences for our community. The ensembles bring scholarship, performance, and mentorship to our stages and classrooms...we bring the opportunity to work with students. Our partnerships extend to all of the major performing ensembles and arts organizations in the Greater Toronto Area (GTA)...proximity to great sounds and organizations is one of the best features of our location in Toronto—a world city for music. Resident Ensembles include Cecilia String Quartet, Gryphon Trio, Nexus Percussion, Tafelmusik Baroque Orchestra, and the Toronto Wind Quintet. Visiting Ensembles with a significant recurrent presence include the St. Lawrence String Quartet, New Orford String Quartet, Festival Winds, and Theatre of Early Music.